Carl Hempel famously crystallised an obstruction to the formalisation of inductive reasoning as the “Raven paradox”: Suppose I am an ornithologist, concerned to prove my world-shaking hypothesis, “All ravens are black”. I could go out into the field with binoculars and observe ravens. Suppose that over the course of the week I see 198 black ravens, 0 white ravens, 0 green ravens, and so on. These are strong data in favour of my hypothesis, and my publication in the Journal of Chromo-ornithology is assured. (And if they turn it down, I’ve heard there are numerous black studies journals…) But it gets cold out in the field, and sometimes damp, so I could reason as follows: “‘All ravens are black’ is equivalent to ‘all non-black objects are not ravens’.” And in my warm and dry study there may be no ravens, but there are many non-black objects. So I catalogue all the pink erasers and yellow textbooks and white mugs, and list them all as evidence for my hypothesis. Regulations are commonly enforced by fines. Economic logic says that the level of fines should be set high enough to discourage most of the violations, and if the laws are being violated frequently that means that the penalties are set too low. But that’s not how British politicians and businesspeople think. I commented before about how the Conservatives seem to think that high levels of speeding and parking violations are prima facie evidence that the laws need to be changed, rather than that there needs to be more effective enforcement. Now we have this comment in the Oxford Times about the “bus gate” (ban on private vehicles) in one part of High Street. It should be prefaced by saying this is hardly an arbitrary restriction. Because of river geography and the huge space taken up by colleges, Oxford is inevitably a challenge for transport. High Street is sufficiently congested at most times of the day, with just buses, taxis and bicycles, as well as the vast numbers of tourists on foot, as to be difficult and dangerous to pass through. A top businessman said Oxford’s bus gate in High Street should be reviewed after it emerged council bosses have raked in fines totalling more than £6m over 10 years. The bus gate uses camera enforcement to restrict normal traffic from using the High Street between 7.30am and 6.30pm. After the £6.2m fines total emerged following a Freedom of Information request by the Oxford Mail, Jeremy Mogford, owner of The Old Bank Hotel in High Street, called for the restriction to be reviewed. Weirdly, he also seems to believe that it’s a problem that many of the scofflaws paying the fines are tourists. Given that Oxford has to pay a huge burden for maintaining transport infrastructure for millions of annual visitors who don’t pay local taxes, what could be more appropriate than that those who abuse the system and endanger our lives to get an advantage would pay the costs. “I do think the bus gate should be better signposted in High Street because some drivers are clearly missing the signs or ignoring them. “It’s quite likely some delivery drivers will go through the bus gate and pay the fine instead of spending half an hour going all the way round. I agree with the first point, though the current signs don’t seem obviously deficient. As for the latter, I don’t really object. Fines can serve as a kind of stochastic congestion charge, allowing those with an urgent need to use a certain resource to pay the cost. I think that a formal congestion charge is better, though, since it is less ambiguous, more predictable, and removes the taint of illegality. Sir Bernard Hogan-Howe, the Metropolitan police commissioner, called for calm in an interview with Sky News on Friday, saying: “I don’t think it’s likely but I think we all know it’s a possibility — the threat level is severe and so therefore that means a terrorist attack is possible. I’d say that calling the threat level “severe” is not what you do when you want the public to be “calm”. But then, his description corresponds to the official designation “moderate”. Obviously, no one wants to be the one who lowered the threat level right ahead of an attack, whereas leaving the threat level up for a few extra months (or years) has only diffuse and impersonal costs. Except that then you have to go out telling people that they shouldn’t really panic, even though the government says a terrorist attack is highly likely. 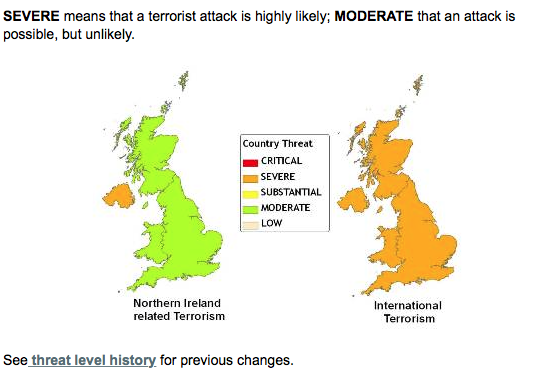 There are just two “regions” whose threat level needs to be communicated. Is it really helpful to paste them onto geographically detailed maps of the United Kingdom? I’m guessing that, while they don’t want to specify any particular regions as potential targets, they don’t specifically want to make the point that Portree is equally at risk to certain southern metropolises with names beginning with L.
Another person has been shot in the US because he was brandishing a toy gun. Officers shot and killed a man who brandished what appeared to be a handgun but was actually an air gun after they told him to leave a restricted parking lot outside a San Francisco police station. The air gun did not have a colored tip on it, which is a standard identifier of a toy gun, Officer Gordon Shyy said Monday. Actually, this wasn’t even exactly a “toy”. More, a sublethal weapon. I’m generally not the most sympathetic to police officers who kill the citizens they are supposed to be protecting. (In Utah last year police were the leading category of homicide perpetrators.) And the case of the boy who was shot on a playground because he had a toy gun clearly seems tinged with racism. But I can’t blame the problem on a lack of coloured tips on the gun.